The mood of uncertainty and fear of loss gripping South Africans and the world in recent days as Nelson Mandela hangs onto life was offset by the country's sports minister Fikile Mbalula who said people should celebrate as they pray for the life of the former president. 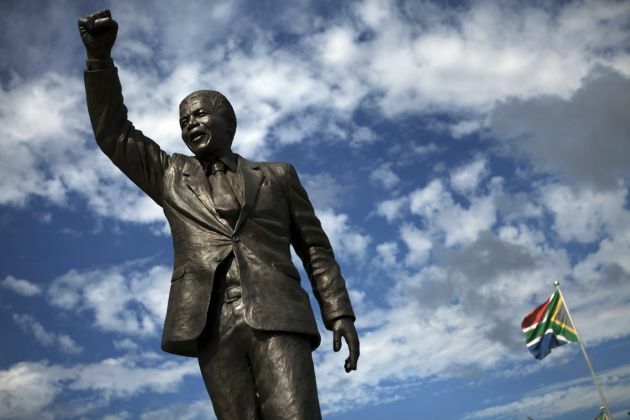 "The events around us dictate that we pass our salutations to the leader of our people, the father of the nation, a great thinker, unifying force, Nelson Mandela," Mbalula said at an international conference in Johannesburg on Thursday. Makgoba's prayer for South Africa's greatest icon against the racist ideology of apartheid said, "May your arms of love, stretched wide on the cross for us, Now enfold Madiba [Mandela's clan name], and Graca, with compassion, comfort and the conviction that you will never forsake them but that you will grant Madiba eternal healing and relief from pain and suffering." The Anglican leader, one of who's illustrious predecessor's was Desmond Tutu - a Nobel Peace Prize laureate like Mandela - said in an interview with South Africa's Times newspaper on Thursday that that many people are afraid to let the 94-year-old go, but he noted that that all mortals die. "I think we are all afraid to let him go because he has been such an icon and a wonderful human being. We do not have such human beings come and go. It is the enormity of him being greater than life that is overpowering us," said Makgoba who has lived as a neighbor of Mandela in Cape Town. Rev. Ziphozihle Siwa, presiding bishop of the Methodist Church of Southern Africa, on Wednesday appealed to people of every faith to join him in praying for Mandela. "We will continue to pray for him, but most importantly, may this time of his illness be a moment where we revisit his ideal of a better world and commit ourselves to be the agents of that better world, as he had given himself to that," said Siwa. "There is that passage of scripture in Matthew, chapter 25, where Jesus speaks to the people who helped the little ones, those who have responded to the needs of those who are suffering in one way or the other," he said. "In other words, 'I was in need, and you helped me.' And so God rejoices with people who have responded in that way," said Siwa as a reminder that Mandela spent 27 years in prison fighting white racist rule.